Q: Congress designated Yellowstone as the world’s first national park in 1872. Can you name the first U.S. national park east of the Mississippi? The country's first national park east of the Mississippi. Photo © N8huckins/Wikimedia. A: It didn’t take long to establish a national park in the east—it just took a while for one to stick. Just three years after President Ulysses S. Grant signed the bill creating Yellowstone National Park, he signed another bill establishing Mackinac National Park on northern Michigan’s Mackinac Island. This scenic island is less than four square miles in size and situated on the eastern side of the Straits of Mackinaw where Lake Michigan and Lake Huron meet (and where the Mackinaw Bridge connects the state’s upper and lower peninsulas). The view of Lake Huron through Arch Rock, one of the best-known features of Mackinac Island. Photo © D9000/Dreamstime. Senator Thomas W. Ferry was born on the island and led preservation efforts in the 1870s to help maintain the area’s historic character and protect the popular summer vacation destination from development. One of the island’s selling points was a natural limestone arch known as Arch Rock—a rare type of formation in this region of the country and a top tourist attraction at the site. The island contains a number of other curious natural features, including post-glacial rock formations and small caves. Mackinac Island also has an interesting military history. British troops built a 150-foot-high fort there overlooking the Straits of Mackinaw during the Revolutionary War. Control of the fort changed hands between British and American troops several times over the course of the decades that followed until the U.S. Army reoccupied the defense in 1815 and used it as a garrison and fur trading post. The fort became part of the national park when Congress established it in 1875, and soldiers acted as park rangers, maintaining the land in addition to their other military duties. This custodial relationship created a problem, however, when the government decommissioned the fort in 1895, leaving the park without a staff to tend it. The state of Michigan requested ownership of the land, and the federal government agreed, stipulating that it must remain protected as a park, or else revert to federal ownership. The site became Michigan’s first state park, and the historic fort is now a museum. Through this transfer, Mackinac became the first of 26 “lost” national parks that were eventually removed from the federal system. It’s not truly lost, however. 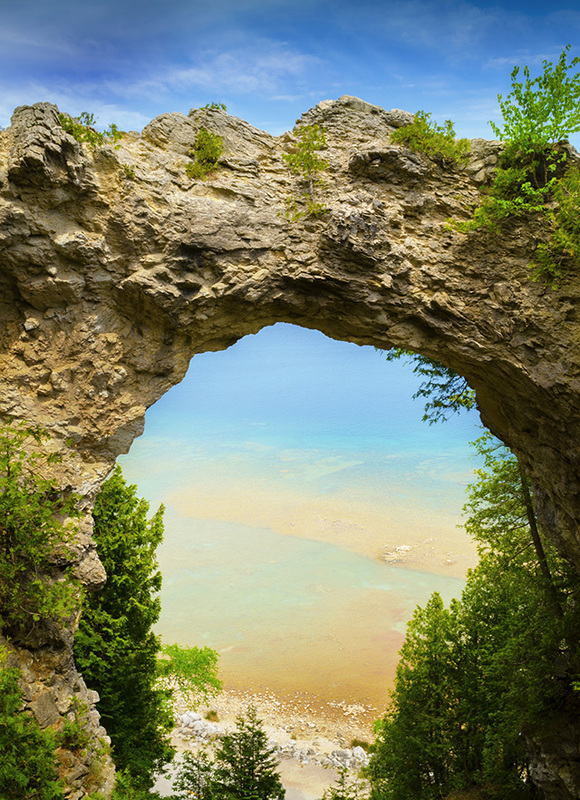 Vacationers in northern Michigan can still enjoy the natural wonders at Mackinac Island State Park. What about the first national park east of the Mississippi that is still a national park? That honor goes to Acadia in Maine. Congress established this park in 1919, more than four decades after Mackinac, and it remains one of the most popular parks in the country.